This is when pollen from a flower’s anthers is transferred to either the stigma of the same flower, another flower on the same plant, or another plant which can be of the same or a different species. Learn how to do this below. In the wild, pollination is normally within the same species, & this is how plants evolve, usually with the assistance of pollinators such as bees. If the new species variations from the offspring are more vigorous & better adapted to their environment than the parents, over a long period of time they can take over from them. 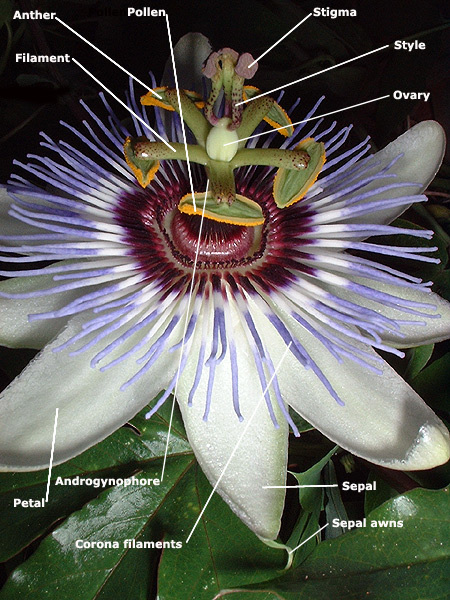 If they become different enough we may categorise them as a separate Passiflora species. It is very rare, but not unknown, to find wild hybrids which are the result of cross-species pollination. Tacsonia will do this more commonly than other Passiflora. In captivity however, when we deliberately transfer pollen, it is usually from a flower of one species or hybrid to a flower of another species or hybrid to create a new hybrid offspring with characteristics of both the parents. Sometimes we can have problems or get unexpected results. Always grow plenty of species plants as hybrids often have little pollen for their pollinators. Some rare bees are at risk because of this. The technique is simple. The moment the flower opens, on the plant chosen to be female, snip off the pollen covered anthers. After midday (to ensure it is ripe) transfer pollen from the anthers of the plant chosen to be the male onto the stigma of the female. Pollen transfer should be done with a camel hair brush or similar. I usually use either fingers or snip the anthers off and hold them with tweezers when applying the pollen. You can also bud pollinate – that is carefully snip the top off a flower that is due to open the next day or two and apply the pollen. This may in some cases prevent the flower rejecting the alien pollen. If germination is successful, hybrids that we produce are by convention named with the female plant first e.g. P. alata (f) x P.caerulea (m) = P. x belotii There are two main reasons to attempt to produce a new hybrid. One is to produce commercial hybrids with improved crop yield, fruit size, hardiness & disease resistance, e.g. P. edulis which has over 15 varieties. The other is to produce hybrids that are decorative & often perfumed, e.g. P. ‘Purple Haze’ & P. ‘Vlasta’.